I’m obsessed with peanut butter. Also chocolate. Also everything mousse. When I found out that there was I way that I could have all of these flavours, I had to give it a try! 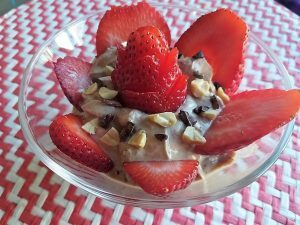 This dish is the perfect combination of creamy, sweet, filling, and healthy! I highly recommend using 2% plain greek yogurt. Greek yogurt is filled with protein, calcium, probiotics, and potassium. It’s also low in fat, sodium, sugar, and calories, so it’s an amazing alternative to so many foods! 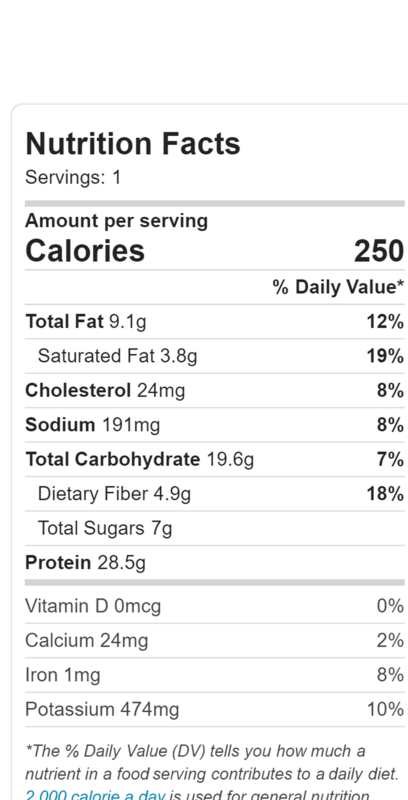 2% yogurt is still very low in fat, will keep you full longer, and is so creamy and delicious. 0% yogurt will also work fine for this recipe, but you may want to add more sweetener to counter the tartness! Change up the toppings when accessorizing your wonder whips – This one would also be great with bananas, chocolate chips if you’re making it a dessert, almond slivers, other berries, apple slices, or with 1/4 cup of your favourite fibre-filled cereal mixed in to add a crunch! Add grapes to make it peanut butter and jelly style! If you haven’t tried peanut butter powder yet, it’s time!!! I add it to baked goods, superfood shakes, oatmeal – I use it all the time! 1 tablespoon of natural peanut butter has 90 calories on average, while peanut butter powder has under 25 calories per tablespoon. And you really only need to add a tsp at a time to most recipes! I will always use regular peanut butter as well, but this is a great alternative to get more yummy peanut butter flavour into more of your dishes if you’re a big fan, like me, without the calorie count! I’ll be making many more varieties of Wonder Whips and experimenting over the next few weeks! Does anyone have any flavours they want to see next? This recipe is kid tested and approved! Combine yogurt, peanut butter powder, cacao powder, sweetener, and vanilla in a bowl. Whip until fluffy with a whisk or whisk attachment of your hand mixer (much faster!). Taste to make sure you have hit the sweetness level that you like. 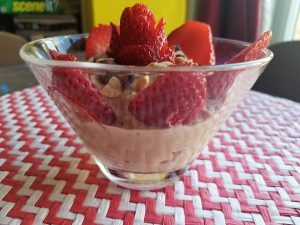 Top with strawberries, peanuts, and cacao nibs! Using a full cup of greek yogurt brings this meal to 300 calories. I don’t have the plain greek yogurt on hand, but do you think the vanilla would be ok and nix the sweetener?